Do You Remember... "The Life and Times of Grizzly Adams". 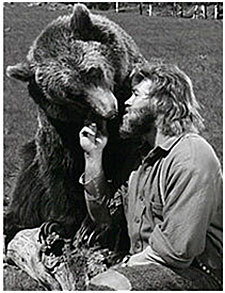 Grizzly Adams as portrayed so well by Dan Haggerty was TV’s quintessential mountain man. 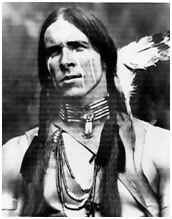 Later, Adams saves the life of a young Indian brave who has fallen over a cliff after being attacked by a mountain lion. Grizzly nurses the Indian—Nakuma (Don Shanks) (right) back to health and they become blood brothers. The only other regular in the series is garrulous old trapper Mad Jack (Denver Pyle—and his mule, Number 7) who more or less relates Grizzly’s adventures. Most of the stories involve Adams’ experiences coping with nature and the few strangers that pass through his wilderness. The Wednesday night 8-9 PM eastern time one hour color series, produced for NBC by Sunn Classic Pictures of Utah came about after the 1974 movie of the same name (written by Larry Dobkin and starring Haggerty) scored a 43% market share when shown on NBC in ‘76. The ‘74 movie based on a ‘73 book was produced on a $140,000 budget and went on to earn $65 million at the theatres. Then third-placed-in-the-ratings, NBC, with nothing to lose, approached Sunn Classics about a TV series. NBC signed up Sunn’s producer Charles Sellier Jr. to put together a 13 episode mid-season replacement tryout which aired from February 9, 1977 to March 11, 1977. Seeming like a death sentence against heavyweight competition from CBS’ “Goodtimes” and ABC’s “Bionic Woman” (5th for the ‘76-‘77 season), Grizzly surprised everyone and garnered a 32% market share. “Grizzly…” took “Goodtimes” down two notches while “Bionic Woman” fell to #14, an encouraging sign of the undeniable chemistry between Haggerty and Ben. NBC expanded the show into a full 24 episode season as of September 28, 1977. It ended with a 90 minute Christmas oriented season finale on December 19, 1978. Beautifully filmed around Park City, UT, with some scenes outside Payson, AZ, though the characters and plots were undeniably homespun—conservation, tolerance, non violence—it was this combination people responded to by tuning in religiously. 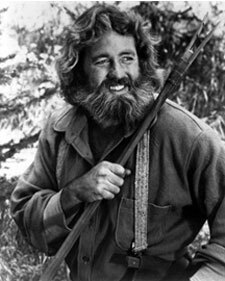 After the series ended on NBC, a 1981 feature “Legend of the Wild” was made starring Haggerty as Grizzly Adams, and his adventures concluded with a 1982 TV movie, “The Capture of Grizzly Adams” in which a bounty hunter used Adams’ daughter—not seen or mentioned since the initial episode—to draw Grizzly back to civilization. In the end, Adams proves his innocence. (This TV movie’s cast included Kim Darby, Noah Beery Jr., Keenan Wynn, Peggy Stewart, Chuck Connors and June Lockhart). Dan Haggerty (no relation to screen heavy Don Haggerty) comes across in the series as a man with a genuine love of animals, and that’s because Haggerty had trained more than 30 African lions and assorted eagles, elephants, chimps, bears, tigers, etc. He’d worked with wild creatures since he acquired a two week old lion cub as a pet from an animal park called Jungle Land in Thousand Oaks, CA. (Many films were made there—“Congo Bill” serial, “Fugitive” episode, “Route 66” episode, etc.) It was there Haggerty met animal trainer Stewart Raffill who owned various animals used in the motion picture industry. Raffill and Haggerty soon became partners in training animals for use in film and TV. Meantime, Haggerty had been working in movies since his 20s, including “Girl Happy” (‘65) with Elvis, “Easy Rider” (‘69) and several biker flicks in the ‘70s. Handling tigers for “Where the North Wind Blows” in ‘74, he was noticed by Sunn Classics who signed him for “The Life and Times of Grizzly Adams”. Noted character actor Denver Pyle went on to play Uncle Jesse Duke on “The Dukes of Hazzard” (‘79-‘85). He died at 77 on Christmas Day 1997. 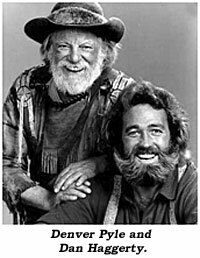 There have been several other actors who portrayed the real life Grizzly Adams. John Huston in “The Life and Times of Judge Roy Bean” (‘72); Gene Edwards, a stunt double for Dan Haggerty, in “The Legend of Grizzly Adams” in an unrelated 1990 film; Tom Tayback in “Grizzly Adams and the Legend of Dark Mountain” (‘99); Jeff Watson in “P., T. Barnum (‘99) (the real Adams was a partner late in life in Barnum’s shows).